The Siemens AG has successfully followed this principle since the 1970’s with the Siemens School Partnership. With the overarching goal of preparing students for the workplace, Siemens has worked collaboratively with schools. With the Siemens School Partnership Program in Germany, the cooperative initiative to enhance social, economical and technological awareness, appreciation and understanding has been further developed within the school community. With a view towards the ever changing challenges and requirements in the current workplace, Siemens strives to use school contacts to address technological developments and tendencies, as well as their far reaching consequences, at the educational level. Students of the Franconian International School benefit from the Siemens School Partnership through their participation in events such as the HANNOVER MESSE / Tec2You, project management and business training seminars and competitions relating to science, mathematics and technology. In addition, students at the Franconian International School have the opportunity to develop educational and social contact with students from the eight Siemens partner schools in the Erlangen region. 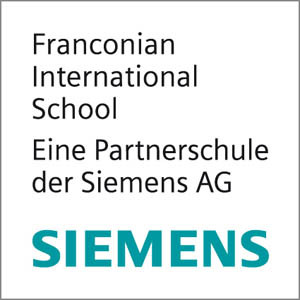 The Franconian International School is proud to be a Siemens Partner School since March 2010.